The outer ply of the P1 is made of Willow, which is generally only used in high-end defensive blades to give it a soft feel and good touch. The P1 seems to be of similar construction and performance as the shakehand D1. 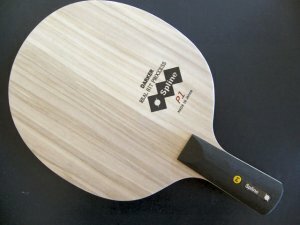 Darker is a Japanese table tennis blade manufacturer that was established in 1955 by Mr. Shutarou Okada. They specialises in premium quality Kiso Hinoki and other blades. The kraftmanship of their blades is second to none, and they are well known to use only the highest quality of Kiso Hinoki and other woods for their blades. Note: OOAK is the authorised distributor for Australia.